Reduces the dangers of hair drying at high temperatures. 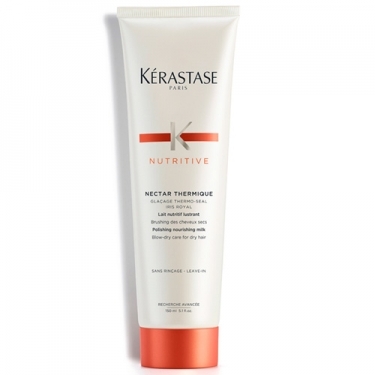 DESCRIPTION: Nectar Thermique from Kérastase is a treatment designed for dry hair. 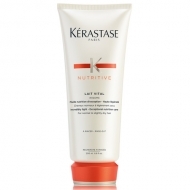 This nourishing and polishing milk acts as a thermoprotector for hair exposed to styling tools. It also provides extreme softness and gloss before the action of heat, before drying with a board or dryer. The heat activates the thermo-reactive formula, attaching the nutritive elements to the fiber, increasing its protection through this protective film. This product contains real jelly extract for a softening action and increased brightness with its richness of nutrients (carbohydrates, proteins and lipids); extract iris rhizome to protect hair from oxidation and prolong nutrition; xylose for its thermoprotective properties; Linseed ciccative oil for intense shine and smoothness. Aqua / Water - C13-16 Isoparaffin - Propylene Glycol - Dimethicone - Triethanolamine - Phenoxyethanol - Peg/Ppg-17/18 Dimethicone - Carbomer - Potato Starch Modified - Behentrimonium Chloride - Hydroxypropyl Guar - Caprylyl Glycol - Polyquaternium-4 - Amodimethicone - Poly(Linseed Oil) - Linalool - Butylphenyl Methylpropional - Benzophenone-4 - Hexyl Cinnamal - Benzyl Salicylate - Benzyl Alcohol - Citronellol - Alpha-Isomethyl Ionone - Trideceth-6 - 2-Oleamido-1,3-Octadecanediol - Xylose - Hydroxycitronellal - Coumarin - Limonene - Iris Florentina / Iris Florentina Root Extract - Cetrimonium Chloride - Royal Jelly / Royal Jelly Extract - Parfum / Fragrance. Do not go through water.